The votes are in and it’s official, the winner of February’s Chapelboro.com Short List for “The Best Place to watch March Madness” in the Chapel Hill-Carrboro area is Tobacco Road Sports Cafe! Chef, local, fresh-never-frozen, scratch-kitchen — not exactly characterizations you’re used to hearing about a sports bar. Unless, of course, you’re going to Tobacco Road Sports Cafe. With their newest location in Chapel Hill (to go along with fellow restaurants in Durham and Raleigh), Tobacco Road brings fresh, gourmet cooking to a crisp sports bar setting. The kitchen even provides an online list of the local farms and vendors they use for their produce! Foodie’s will love the Lamb Gorditas, the Orrechiete Pasta, or the Country Fizzle Chicken. And the always-unique side dishes include Tobacco Onions, Ranch Style Beans, Sweet Potato Mash, Southern Caviar, Hoppin’ John and Tomato Basil Salad. Of course, Gluten-free and vegetarian options are available as well. 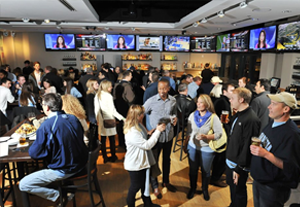 Naturally, it’s called a “sports” cafe for a reason, and it’s no surprise Tobacco Road won the Chapelboro Short List for March 2013 as the Best Place to Watch March Madness. “Infinite Sports” is their mantra and you can catch any big game or sporting event on one of their many flat screen HDTVs. There are even two different patios with one sporting a 100-inch projection screen outside. Check out some March Madness at Tobacco Road while you still can! With Dean Smith’s famous offense as their namesake, Four Corners declares themselves “Franklin Street’s premier destination for fine dining and the Carolina sports experience.” Located on East Franklin St. next to the U.S. Post Office, Four Corners sports over twenty hi-def TVs and was recently renovated with twelve draft beer taps and a full affordable menu with appetizers, sandwiches and “MVP” entrees. With their balcony famously overlooking N. Columbia and Franklin Street, Top of the Hill is often considered the “social crossroads” of Chapel Hill. Open from 11am-2am every day of the week, the full menu showcases locally-sourced food choices and one-of-a-kind appetizers like Polynesian Calamari and Franklin Street Nachos. And, of course, if you’re not in the mood for food you can always check out the new and unique Top of the Hill Distillery for locally-made Organic spirits. The Carolina Brewery on West Franklin Street, and its sister restaurant in Pittsboro, are well-known for remaining locally owned and operated by UNC alumni. Famous for their handcrafted beer, the brewery has won multiple awards for both their staple brews and rotating season specials. And no pub would be complete without fantastic fresh food — the Carolina Brewery showcases a full menu with favorites like the Down East Barbeque Plate. The Station is a beautiful restaurant/bar set on an active railway and built within restored vintage railroad cars. Just like any great downtown Carrboro location, they offer live music from well-known acts and a full menu often packed with local produce. Check out one of four unique bars throughout the “station” to watch games or enjoy drinks.